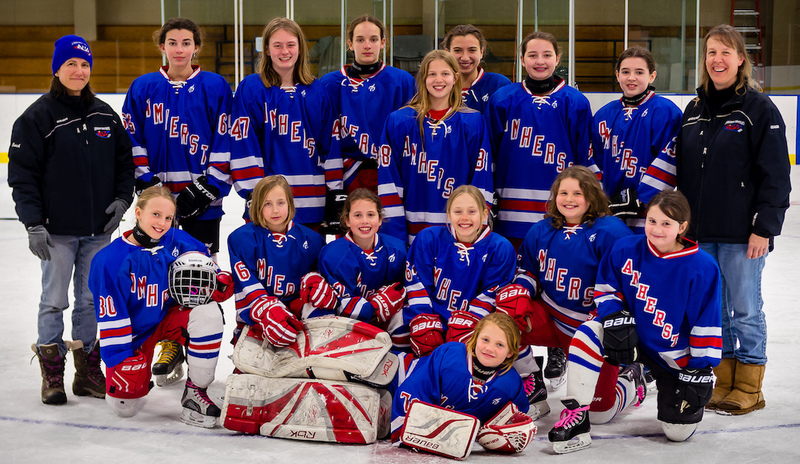 The Amherst Hockey Association hosts a thriving Girls’ Division that recruits, retains, and builds solid skills for girl players with on- and off-ice training, social events, scrimmaging, co-ed and girls’ teams, and more. For the 2019/2020 season, we will offer a full-time 14U girls’ team, part of the Connecticut Girls Hockey League (CGHL). Evaluations will be in March 2019, and girls who are in the 2005-2008 birth years are encouraged to attend. For details on this team, email our Girls’ Division coordinator and CGHL representative Erin Flanagan at . For the 2018/2019 season, we are again offering part-time girls’ teams. We are fielding teams at the CGHL Division I and Division II levels, and teams play 10-15 games. Both newer and more experienced hockey players are welcome. Girls who play with other organizations may also join these part-time teams to get the added benefits, camaraderie, and confidence boost of playing with all girls. As this is a secondary team, we recognize that their full-time co-ed or girls’ teams have priority. Also for 2018/2019, we will again offer our Girls' House Team. Last year the house team had 18 girls, many of whom were brand-new to hockey. Historically, 2-5 of our house team players move on to travel teams each year. The Amherst Hockey Association is delighted to be one of the leaders in promoting girls’ hockey in Western Massachusetts. Visit the registration page for pricing and to register. If you have questions about the girls’ division, please contact our Girls Division Director, Erin Flanagan at .